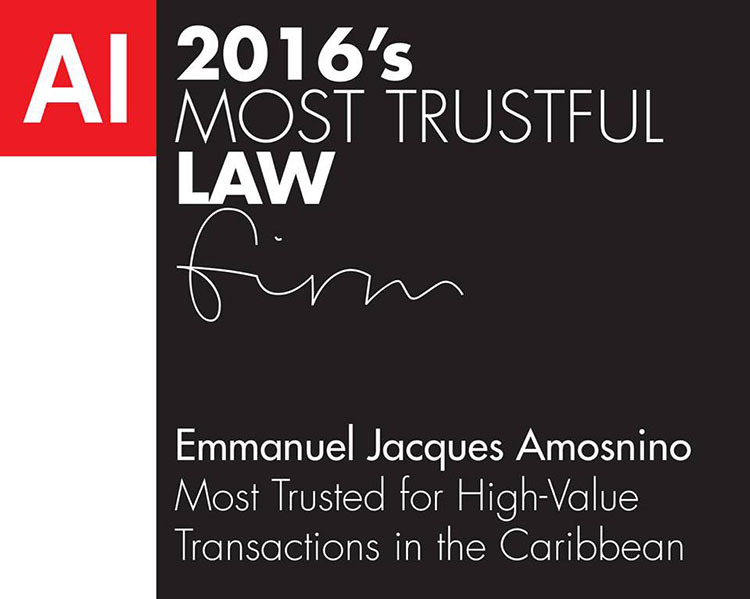 Emmanuel Jacques, Managing Partner, Emmanuel Jacques Almosnino Law Firm (EJA) in Saint Barth, has announced that his firm was the recipient of the 2016 Most Trustful Law Firm Legal Award by Acquisition International magazine. EJA was honored for its outstanding work throughout the international legal community over the past 12 months. During that time, EJA assisted most of the U.S. investors in finding the best opportunities in the real estate market of Saint Barth, in negotiating them and even in financing them. To name a few of the matters handled by the firm, EJA successfully represented a client in a major case involving the ownership of a title to a 580,000-square-foot piece of property in Saint Barth. The firm successfully negotiated the sale of a commercial property on the prestigious Champs-Elysées Avenue in Paris, France. EJA also assisted a famous international brand for the opening of its Saint Barth store this year and handled successfully several business transactions. In 2015, EJA became a member of IR Global, an international organization consisting of the world's leading legal, accountancy and financial advisors. Each firm passes a stringent vetting process upon joining and is recommended exclusively by jurisdiction and area of expertise. On May 18-20, the firm participated in IR Global's annual conference for the first time in San Francisco, California. Nominated by clients, peers, and fellow professionals, voted by the magazine's subscribers and agreed upon by its industry experts, the Most Trustful Law Firm Legal Awards provide a comprehensive go-to resource for those seeking the truly outstanding legal professionals from around the world who go the extra mile to get the job done in style. "We are pleased to have been recognized for all the work that was accomplished for our clients in the past year," Mr. Jacques said. "We thank all our high-net worth clients who nominated us for this prestigious award." To view the award publication, click here.